Poland serves as the geographical and cultural crossroads of Eastern and Western Europe. Once a heavily Communist country, this large country is now free from much of the ties that bound up its economy and social scene. Today, the country enjoys a crucial position as the largest of the former Eastern European states and one of the most populous members of the European Union. Poland presents many opportunities for students including language and culture studies and those focused on the socio-political environment historically and from a contemporary standpoint. Poland has a strong academic tradition goings back to the 14th century. 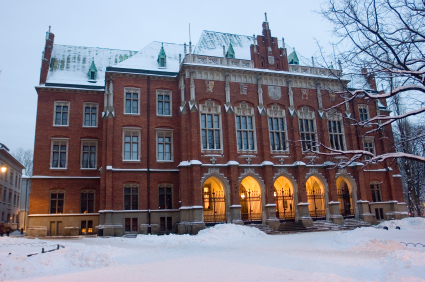 The Jagiellonian University in Kraków was established in 1364, as the second university in Central Europe. Today, Warsaw University is ranked first in the Top Coder international IT ranking. Many opportunities for funding are available to students wishing to study in Poland. The governments of both Poland and the US offer a number of scholarships, as do private institutions and colleges in both countries. Check with both your own college, and with the ones you have an interest, and find out what assistance they may offer. For undergraduates and underprivileged students the Benjamin A. Gilman International Scholarships are a boon. The aim is to help those looking to study abroad who would not otherwise be able to afford it. The goal of the program is to create a more diversified field of people in the ever growing international market. You must be a Pell Grant recipient to qualify and be pursuing an engaging tack of study. Over 2,300 of these awards of up to $5,00o are given out annually for study abroad in hundreds of far-flung locations, including Poland. The David L. Boren Scholarships are equally competitive and well known. Undergraduate and graduate students may apply for consideration. Top-notch academics and a passion for language and cultural studies may earn you up to $20,000 in travel funds for a summer, semester or year program. Boren Fellowships award up to $24,000 for graduate students, with an extra $6,000 that can be applied to domestic language study. These awards come with the condition that awardees return service in a national security agency. The duration of the NSEP Service Requirement is one year or the duration of assistance provided under the program, whichever is longer. Applicants with a career interest in security are given preference as are longer terms of study. Erasmus Mundus scholarships are offered by the European Commission to promote higher education through scholarships and cooperation between Europe and other countries. This program offers scholarships to students at all levels of higher education from all parts of the world. Awards are available to follow an Erasmus Mundus Masters Course or Joint Doctorate at two or more European universities, as well as scholarships to promote the mobility of students between European and non-European universities. Year Abroad Program provides a scholarship for a semester or year for U.S. students with an interest in Polish Studies. Awards cover all expenses except for travel costs. Applicants must have an excellent academic record and be pursing a four-year undergraduate degree. Graduate Study and Research in Poland Grants are provided to graduate students whose research or studies require a semester or year in Poland. Awards are applied to living expenses, and do not cover tuition or travel. Students, undergraduate or high school seniors, who want to spend a summer studying Polish in Krakow at Jagiellonian University, or the John Paul II Catholic University in Lublin, may apply for the Tomaszkiewicz-Florio Scholarships. Applicants must be academically motivated and have an educational goal when applying. Awards cover room and board in Krakow, but funds for travel are limited. Rotary International offers District grants for study in any field of study, for any level, length of time or location. To apply for a district grant, please submit your funding request directly to your district. Global grants provide funding for nursing and midwifery study overseas, as well as scholarships for graduate-level academic studies that relate to one or more of the areas of focus. Students at the top of their class and heading off to Poland may apply for either the Charles and Marjorie Gliozzo Merit Scholarships or the Office of Study Abroad Academic Excellence Awards. The MSU Credit Union is one of the university’s largest scholarship sponsors and therefore the widest selection of awards is drawn from this fund. Applicants are considered for a combination of academic merit and financial need. Up to $1,000. Forest Akers Scholarships are specifically held for those students who might not otherwise be able to financially afford a study abroad program. Applicants may not be receiving the Pell Grant, but must demonstrate a debilitating level of financial need. Up to $500 available. Out-of-state students may qualify for the Presidential Study Abroad Scholarship, for use with an approved, MSU study abroad program. Student majors in Wayne State University’s Department of German and Slavic Studies who are pursing Polish studies might qualify for the Friends of Jagiellonian University Scholarship. The funds make it possible for a varying number of scholarships to be awarded to students in the department who would like to study in Poland for a term. Funding varies.